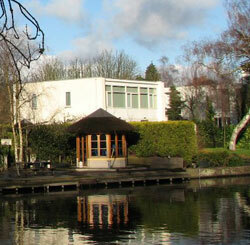 Slotervaart is one of the Western Garden Cities, along with Geuzenveld/Slotermeer and Osdorp. Half the housing in Slotervaart is social-rent, a quarter owner-occupied—it is the district with the second-highest percentage of owned houses in Amsterdam, after Osdorp. The houses are generally lower priced than other parts of the city. More than half of the population are foreign-born, mostly from Turkey, Morocco and Suriname. There are few senior citizens.